Artisan Triangle 6" steel triangle with a versatile dynamic range, and remarkable tone, for a superior general use triangle. 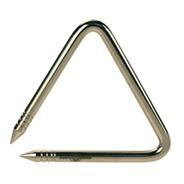 Black Swamp steel Artisan triangles sound rich and dynamic. Each size produces a shimmering and consistent overtone spectrum throughout its entire dynamic range. Artisan Triangle 6" steel triangle with a versatile dynamic range, and remarkable tone, for a superior general use triangle. Black Swamp steel Artisan triangles sound rich and dynamic. E-Nickel plating doesn't interfere with natural overtone production, and provides resistance against corrosion. Each size produces a shimmering and consistent overtone spectrum throughout its entire dynamic range.